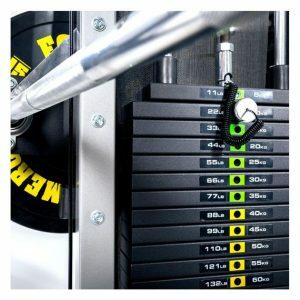 Let’s talk about functional trainers, also called cable machines. 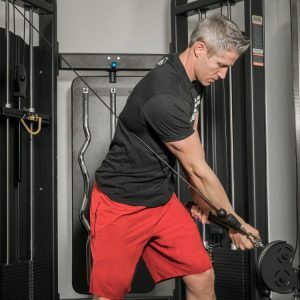 It’s a cable machine that uses two independent weight stacks, pulleys, and cables (with handles) to provide unique workout benefits. Here’s an example – the Victory Multi-Grip Functional Trainer from Rep Fitness. And how is this different than a cable crossover machine? The pulleys and cable handles are height adjustable – and this lets you work from any angle. This makes a functional trainer much more flexible compared to a cable crossover. The weight stack is normally selectorized, such that you can choose the desired weight quickly and easily by inserting a pin underneath the weight load. You pull on the handles to raise and lower the weight – you can use one arm (or leg) or two. The cables and pulley provide a smooth, controlled and constant tension. 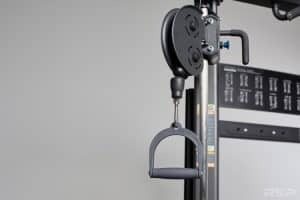 There’s also a type of cable machine called the cable crossover – it’s very similar to a functional trainer, but the pulleys may or may not be height adjustable – that’s the biggest difference. Is the cable machine superior to free weights such as the barbell, dumbbell, and kettlebell? Each is different and have their unique capabilities. Isolateral exercise – It’s easy to perform single leg or single arm exercises – working one side of your body at a time. This means you can improve on a lagging body part, or rehab a problem area very specifically. Balanced work – because the weight stacks are independent you can ensure that each arm (or leg) is doing it’s share of the work. This is unlike a barbell where your “strong side” often ends up doing more of the lifting. 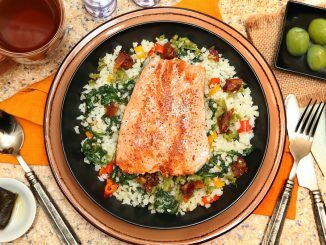 You could also load more weight on your weak side, by choosing a different weight selection for the second weight stack. 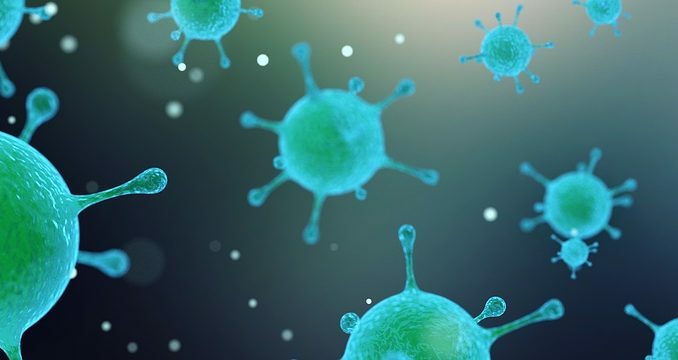 Isolation – It’s easy to isolate a muscle or joint. 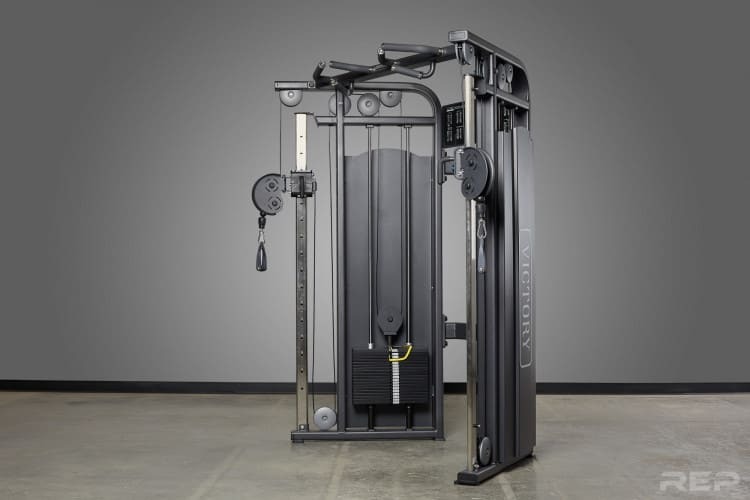 Continuous Tension – The cable machine provides a smooth, continuous tension – because the weight stack is moving straight up and down. Angles – the “multiplanar” nature of using cables means you can work nearly any angle or plane with a cable machine. That means every muscle and every plane of motion can be trained. Full body workout – these machines can be used for your upper body, core, and lower body. A single machine can usually accommodate 36 or more individual exercise movements. 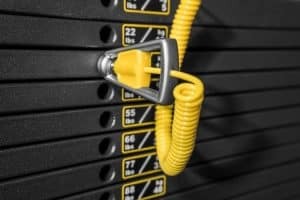 Why are these cable machines called functional trainers? 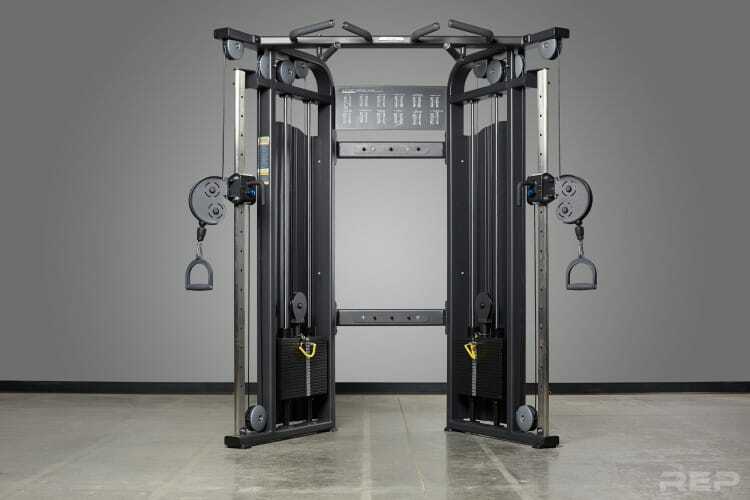 The fact that these machines are multiplanar is what gives them the name functional trainer. You can duplicate nearly any real world movement you might be doing and build strength in that specific movement. 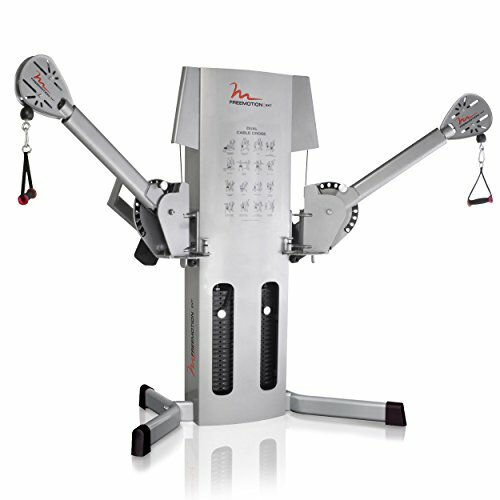 The cable machine allows you to do exercises that you could mimic in everyday life, such as twisting, lifting, bending, and reaching. As such, these exercises are very functional. Meaning, they mimic real world movements – by building strength and stability in a coordinated fashion. What sort of exercises can you do with a functional trainer? Chest Press, Chest Flye, Seated Shoulder Press, Standing Side Raise, Rotator Cuff – Internal, Standing Bicep Curl, Glute Kickback, Tricep Pushdown, Rotator Cuff – External, Standing Leg Abduction, Ab Cruch, Standing Leg Adduction, Squat, One Arm Row, Kneeling Lat Pulldown, Pullups and Chin-ups, Reverse Curl, Golf Swing, Twist & Lift, Squat, Tricep Extension, High Row, Hip Raise with Twist, Balance and Pull, Rear Deltoid Crossover, Torso Rotation, Downward Chop, Bent Legged Deadlift (Stiff Leg Deadlift), Underarm Throw, Overhead Throw, and Low Sweep. 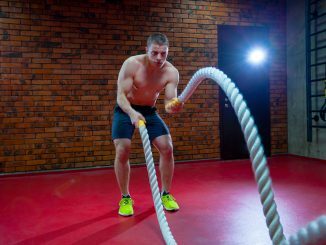 Here’s some other benefits of the cable machine. Most (but not all) of the exercises are performed in a standing position – and when performing single arm or single leg (“isolateral”) exercise you are going to get a significant core or anti-rotation workout. Given the selectorized weight stacks it is very easy to change weights quickly. 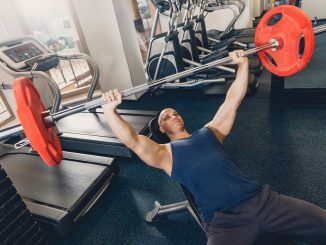 This can be a particular benefit when you are performing supersets or circuit training – rapidly switching movements and loads to achieve a cardio training effect along with strength improvements. These machines are also versatile – you can train your entire body (including your upper body and lower body) all with one piece of equipment. 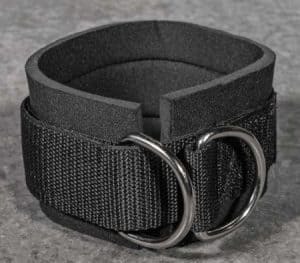 With ankle straps or ankle cuffs you can easily perform a variety of lower body movements. You can also add a bench and perform movements that mimic traditional seated (or lying) free weight exercise – such as the bench press. It’s safe to say you could get a whole body workout from this single piece of equipment. Functional trainers are also very safe – and that’s less intimidating to gym newbies. Younger people, older trainees, and those that are new to the weight room might shy away from the imposing barbell and plates. But the functional trainer is easy to use, easy to get started, and very safe. This is a machine the wife and kids will use. The height of the cable handles is also easy to adjust. Young or old, tall or short – these machines will work for everyone. You also don’t need a spotter – there’s no practical way that you could drop the weight and injure yourself. 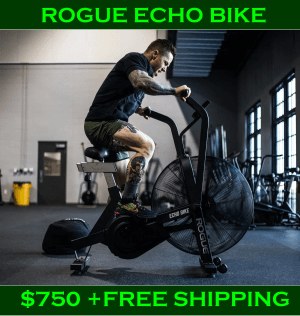 It’s great for those that want to (or need to) workout alone. And lastly, the smooth controlled motion and constant tension provided by the cable machine can be great for rehabilitating an injury. What features should you look for in a functional trainer? Let’s start with those selectorized weight stacks. Many machines offer a 150 lb weight stack, or a 200 lb weight stack. And don’t forget there are two. We recommend you get the 200 lb weight stack (or more) if possible. Because the pulley on these machines give you a mechanical advantage in strength. The pulleys have a ratio – typically 2:1 or 3:1. If you can bench 400 lbs on a machine, can you bench 400 lbs on a barbell? No – the pulleys used in these machines give you a considerable mechanical advantage. For example, on a machine with 2:1 pulley ratios that 400 lbs of weight (2 weight stacks of 200 lbs each) means you are really only lifting 200 lbs. So, you won’t really be lifting 400 lbs total on a two stack machine with 200 lbs. You’re actually lifting 200 lbs. And as such, it’s totally reasonable that you might squat or bench press 200 lbs. The flip side of that is most machines max out just north of 200 lbs per stack. You aren’t going to build a world class powerlifting total with this machine. But, that’s not what most people want anyways. You can build and maintain plenty of functional strength for real life with these machines. Look for smooth, quiet nylon coated cables and high quality pulleys. Remember that all the lifting is done via the cable handles through the pulleys. If the cables or pulleys move awkwardly or make sound – it’s going to make your workout less pleasant. All functional trainers will come with a basic set of simple handles. It’s a bonus if you can get a variety of grips, handles, and attachments. 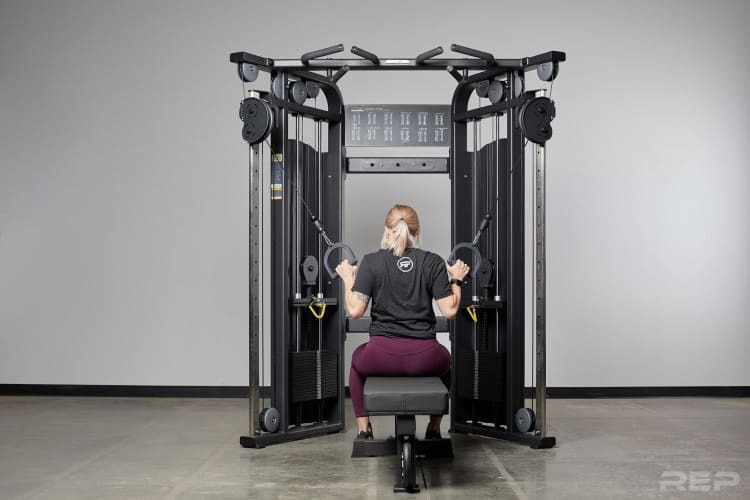 For example: Basic handles, hand straps, long strap handles, triceps ropes, a short bar and knurled long bars all help give you a multitude of options for upper body work. The curl bar is angled such that you can find the grip that doesn’t aggravate elbow tendons. For the lower body look for ankle cuffs that allow you to do leg curls and other leg exercises. A sports handle will be ideal for golf and baseball swing training. They are not practical to move when you are not using them – so be sure you understand the total footprint required for these devices before you commit to one. Look for a space efficient corner design is our advice. They are also tall – so make sure there is sufficient over head space. 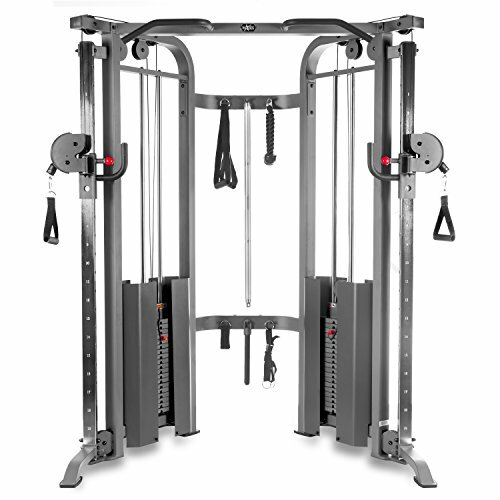 That can be a benefit as well because the best cable machines also have a multi-grip pull-up or chin-up bar attached. Both pull-ups and chin-ups are excellent bodyweight exercise. The other downside of these monster sized cable machines? They usually only ship via freight carrier – which can be expensive. They also take a good amount of time to assemble (dozens to hundreds of parts) – and assembly will probably require two people. On the upside, most of these machines are tough, meant for commercial gyms, and will last a lifetime. There’s usually a considerable warranty to back that up as well. 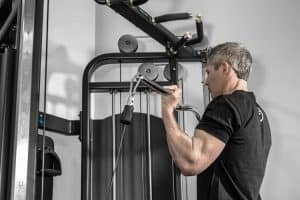 Now that we understand what makes a good cable machine, let’s look at some versatile and affordable functional trainers for the home gym and garage gym. Our first pick is the Victory Multi-Grip Functional Trainer from Rep Fitness. This model has two 220 lb weight stacks with a 2:1 ratio (moving 100 lbs takes 50 lbs of effort). This is plenty of weight for a variety of exercises. 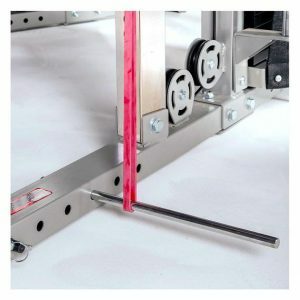 Making weight changes is easy thanks to the magnetic tipped weight selector pin for secure adjustment, and the highly accurate steel weight plates. When adjusting the pulley height, the laser etched cable column markings make it easy to line up both handles. The pulley system is high quality – as we like to see. The smooth cable operation is thanks to the fiberglass reinforced pulleys. There are no jerky movements or “catching” when you use the machine. This machine is also built robust from 11 gauge steel, with a durable powder coat finish in a beautiful black metallic color. 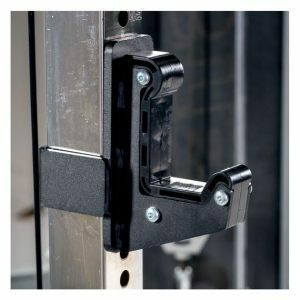 There are multiple pull-up grip options with rubber coated grips for comfortable pull-ups and a secure grip. The handle attachments can be stored in the center attachment holder with pop pin rotation for storage on both sides. Two urethane strap handles are included – but an extra accessory package is available that includes more options. 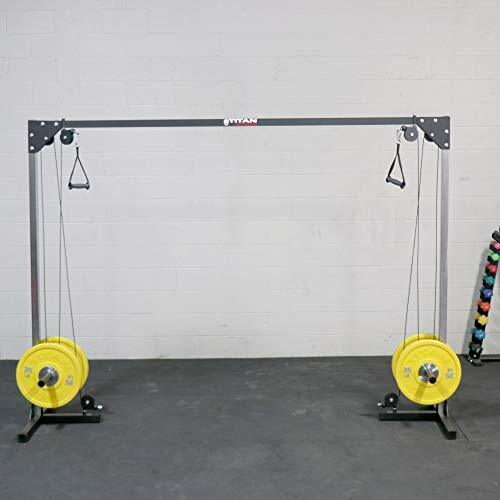 This Rep Fitness functional trainer would be great for a home gym or garage gym. 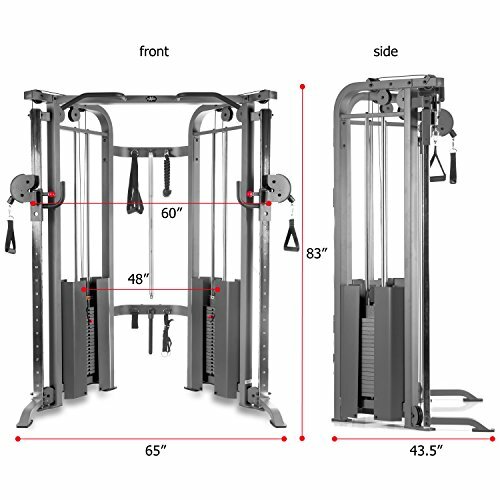 The XMark Functional Trainer XM-7626 (Buy on Amazon) is also one of our top choices. 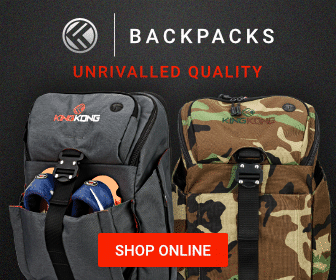 First of all, it’s got the dual 200 lb weight stacks (with a 2:1 pulley ratio) that we recommend. The weight stacks are in 10lb increments. This unit is versatile and easy to adjust. The pulleys have 19 height settings spaced 3.5″ apart. The pulleys can be adjusted as low as 1′ or as tall as 6′ 6″. 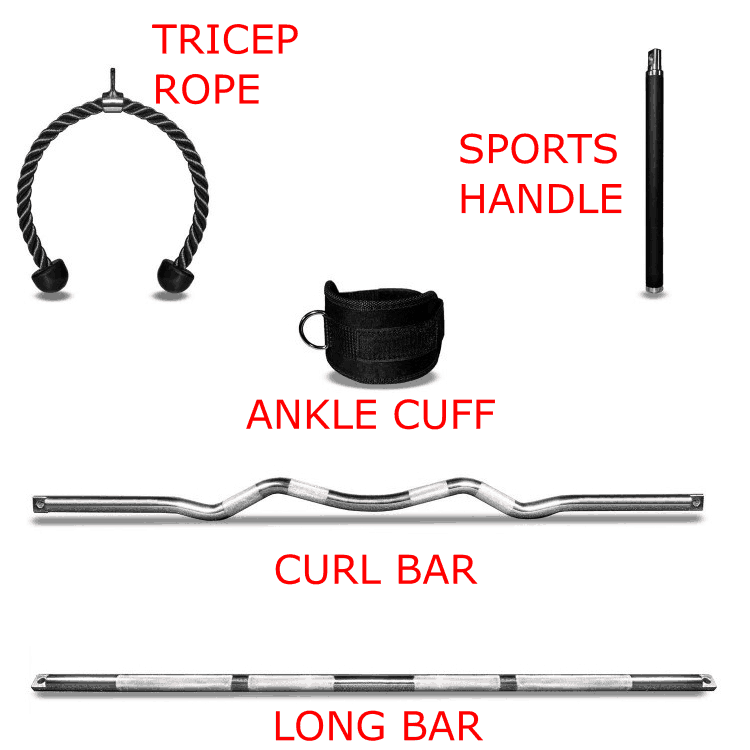 Several easily interchangeable accessories are included: a pair of 8″ hand straps, a pair of 17″ long strap handles, a 23″ tricep rope, a short bar and a 42″ long bar, leg extension leg curl strap and an ankle strap and workout poster. The XM-7626 provides true isolateral-based movements, allowing users a variety of options for muscle targeting and isolation. 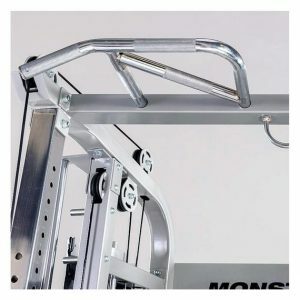 This unit also includes the pull-up bar or chin-up bar that we recommend. The XM-7626 is built from heavy duty 11-gauge 2″ x 3″ steel mainframe construction. It’s also constructed with a commercial grade pulley system. Assembled Dimensions are 65”W x 43.5”L x 83” H.
The FreeMotion Dual Cable Crossover Machine (Buy on Amazon) is also an excellent piece of equipment. You’ve probably seen this unit in a commercial gym. 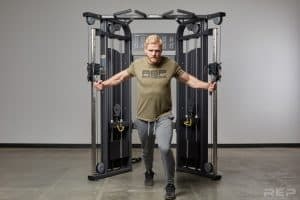 The only caveat with this machine is that the pulleys provide a 3:1 ratio – so each 240 lb stack is really only equivalent to 80 lbs of resistance – or 160 lbs combined. And, there’s no pull-up bar. It’s also a good bit more expensive than our other picks. 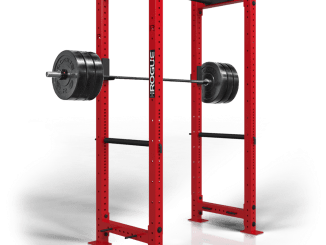 What if you want all the benefits of a functional trainer and a full power rack (squat rack) all in one unit? 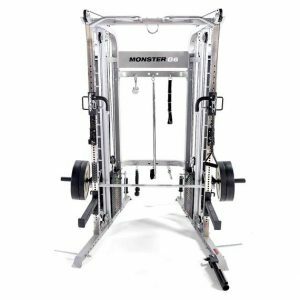 The Monster G6 Power Rack, Functional Trainer & Smith Machine from Force USA does all those things – all in one gym rack. First of all, this is a full featured power rack or squat rack for use with any of the barbell exercises such as squats and bench presses. 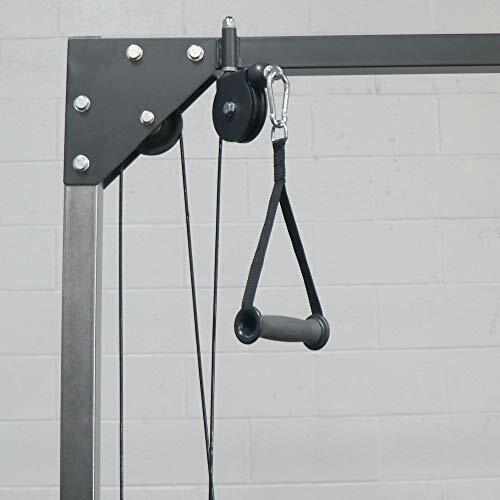 It has commercial grade J-Hooks (J-cups) and safeties (via spotter arms) which can be adjusted to any height position you need. It’s got a chin up bar with multi-grip options. 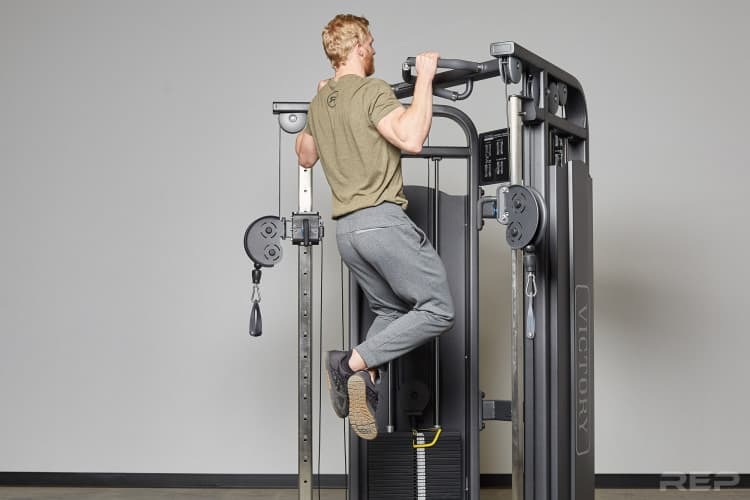 The ergonomic multi-grip chin-up/pull-up station lets you use close grip, wide grip, overhand, underhand, etc. And it even has storage for plates and barbells, as well as your handle attachments. For the functional trainer part there are dual 220 lbs. weight stacks with commercial grade aircraft cable, quick and easy pop pin positioning adjustment of the handle height. This unit is compatible with a huge range of attachments for almost any exercise you require. The pulley ratio is 2:1. Not enough resistance for you? You can also add bands for extra resistance thanks to the band pegs. The ability to supplement the weight stack resistance with bands is a unique feature of this unit. This unit’s dimensions are: 58” (L) x 55” (D) x 91” (H). It’s built robustly withy heavy gauge steel and has a commercial grade powder coat followed by a clear coat for maximum durability. 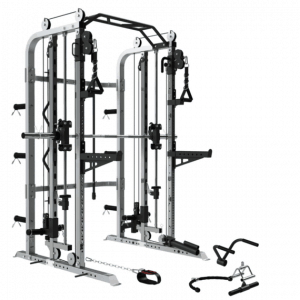 This is the most complete unit “all in one” unit we’ve ever seen offered for a home or garage gym. It’s also compatible with additional accessories such as an optional leg press or landmine unit. The G6 is a top of the line model. If your needs (or budget) are more modest, check out the G3. 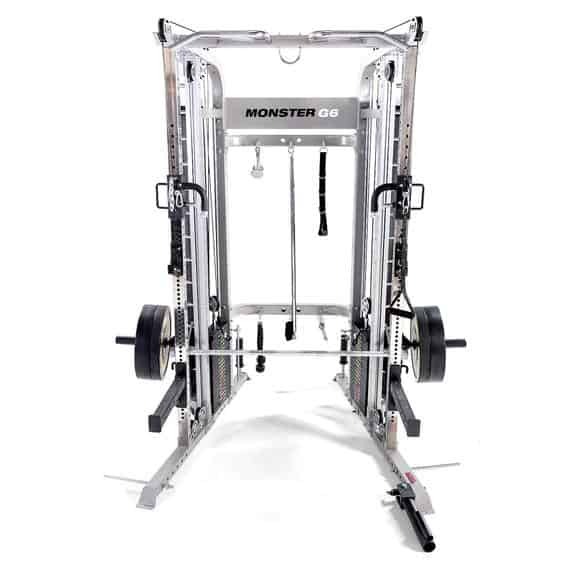 Force USA also has a less expensive version called the Monster G3 Power Rack, Functional Trainer & Smith Machine Combo Base. Why is this unit more affordable? The G3 does not have the built-in dual weight stacks. Instead you load your Olympic weight plates for resistance. It does have the pulleys (2:1 ratio), cables, and handles needed for the functional trainer. The Spotter Arms are also an optional (but recommended) add-on for the Monster G3. 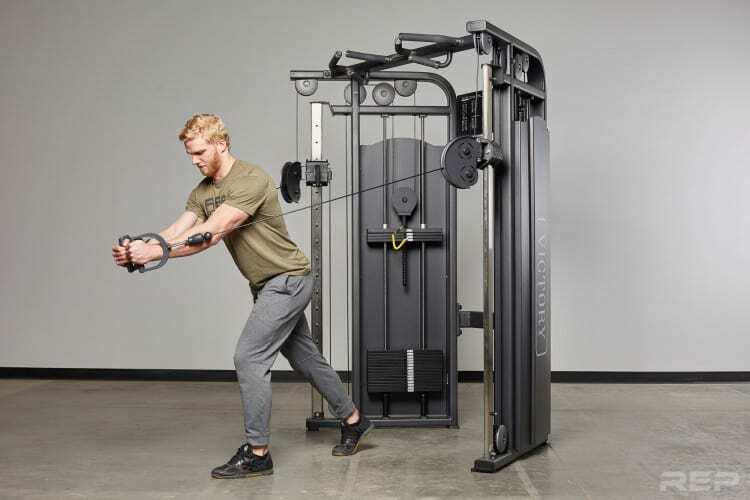 Cable Crossover vs Functional Trainer Most cable crossover machines don’t have height adjustable pulleys – so they aren’t as useful as functional trainers. You don’t get as many options to work your muscles from different angles. But, some cable crossover machines do have height adjustable pulleys – and those are very similar to functional trainers. Ok, those are some great options for a functional trainer. Let’s take a look at a Cable Crossover Machine now. What About Cable Crossover Machines? Somewhat similar to a functional trainer is a Cable Crossover Machine, such as the Titan Cable Crossover Machine (Buy on Amazon). The model CCRSOVR1-CCRSOVR2 Cable Crossover machine is a typical unit – but it is a budget unit. The main difference is that the pulleys are not height adjustable – you have a low pulley or a high pulley – and nothing in-between. This Titan Fitness unit is a budget model, so there’s no weight stack, you load plates on it. It is meant to be compact and re-locatable such that you can use it in a garage gym and re-position it as needed. I personally wouldn’t recommend doing pull-ups or chin-ups off this model. The unit itself only weights 110 lbs, which would make it easy to move, but I wouldn’t use it for any purpose other than intended. This unit will fit in a room with 8′ ceilings. Functional trainers are a type of cable exercise machine can give you a total body workout in a safe, quick, and efficient fashion. They can also be used to supplement traditional free weight exercises. And while they are expensive and take up a considerable amount of space the variety of options they provide make them worth the expense. They are great for a wide range of trainees (young or old, experienced or new), rehabilitative exercise, and for specialized sports training. Some of the photos used in this article are property of the manufacturer. 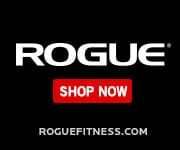 We’re an affiliate of Rep Fitness, Force USA, and Amazon. 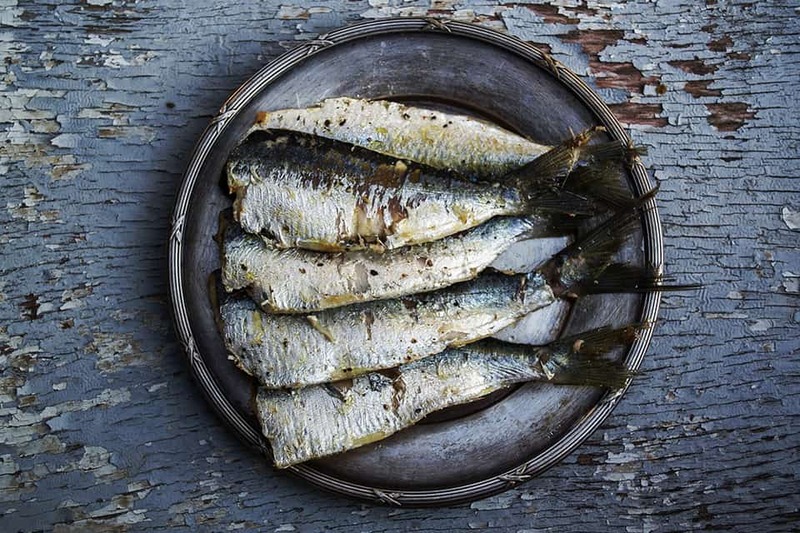 If you click the links in this article we receive a small fee at no additional cost to you. 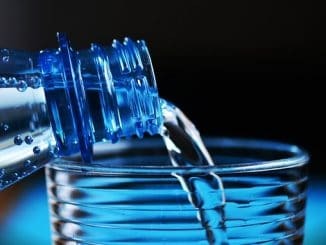 This helps us to bring you great information to make the right choices for your health and fitness.